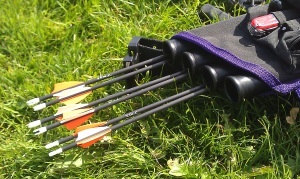 If you've never tried archery or have only had a brief taste of the sport we offer a number of different options. We regularly run beginner courses designed as an introduction to archery. These six-session courses are run by our coaching team who teach the basic skills required to shoot safely. The course costs £60 for adults and £40 for juniors (under 18). The courses are open to all age groups though we suggest that children under the age of eight can be a little too young to understand, react and remember the coaching points. Please see about us for further information on our latest courses and links to EventBrite to book a places. We also offer structured have-a-go sessions usually in September at our outdoor venue. Please use our enquiry form to book a place or request further information. We are able to run have-a-go events that can be tailored to corporate events or as part of other larger events such as a local festival. Please contact us if you would like us to consider attending your event. Your yearly club membership also includes membership of Dewsbury Moor ARLFC. Club/associate membership can be paid either as a full amount or in instalments. Archery GB membership is mandatory for all members and must be paid in full when due. To shoot with us as a non-member you must have valid Archery GB affiliation. Please bring your membership card (or temporary card/waiver) with you. You will not be allowed to shoot without it for public liability purposes. All images and content are copyright of Savile Bowmen unless otherwise stated.